Bolivia is a good country for old Land Cruisers like ours because the shorter version (FJ40) drives around all over the place. Spare parts are therefore easily available although you have to check the quality. Chinese copied junk is simply sold as “original”. Everything is original. Beware. Overall, our experiences to get the Land Cruiser fixed in Bolivia have been from okay to disastrous. The main question is whether or not the mechanic in question feels like taking on a certain job. After our trip to Salar de Uyuni we had the Land Cruiser thoroughly cleaned in Uyuni for 3.5-5 euros (Aug ’07 and Jan ’10). The exhaust broke off and when fixing that we discovered a part of the chassis had broken off too. We could no longer postpone the overhaul job. One of Coen’s recurring headaches: electricity problems. In the spring of 2010 we spent six months in La Paz for an overhaul of the Land Cruiser. 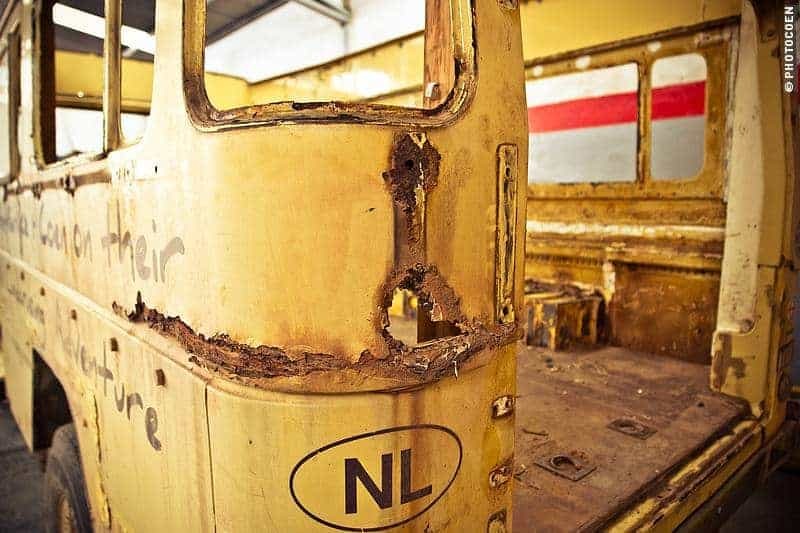 The car was dismantled in its entirety, the many holes due to rust were welded and the car was repainted. Simultaneously we took the opportunity to install a second diesel tank and to attach the spare tire to the back door. We replaced/repaired many other parts as well: door rubbers, radiator, fuel lines, etc. Total expenditures: about 5000 euros. 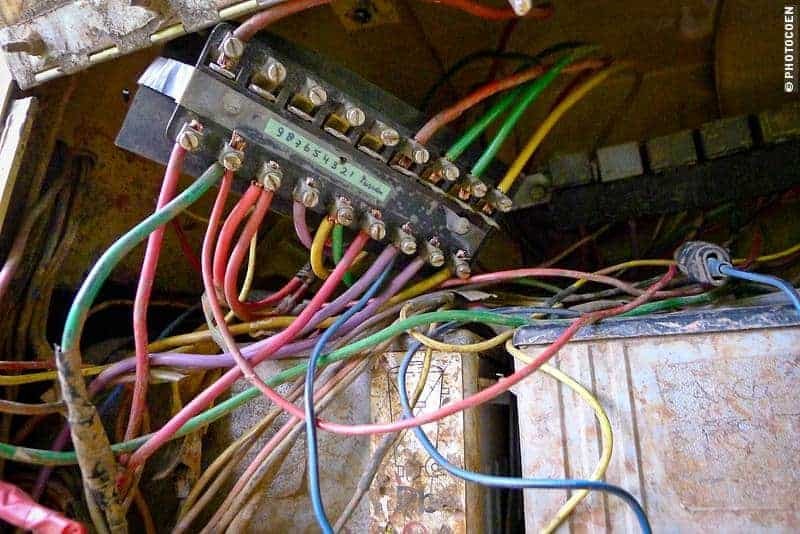 Do we recommend having an overhaul done in Bolivia? It’s tempting to look only at the low costs, but you should realize that for this money you don’t get European quality either. After six months of hard work we (unfortunately) cannot but confirm the stereotypes: you have to be present every day, you have to check all the work done, you need lots of patience and perseverance to get the job done. Write down in detail what work needs to be done and what it costs – make clear what projects may be done (and paid) additionally. Include a penalty clause in the contract. If the job isn’t finished on the day agreed upon, the workshop owner has to pay a certain amount of money per additional day of work. Never pay the entire amount before the last chore is finished. The boss of the overhaul job always wanted money up front, to buy the spare parts and to pay the employees, which was only reasonable. Yet keeping money back (like the penalty clause) was the only way we could put pressure on the job. The issue of money brought a great deal of stress. If we had not taken these measures, we would most likely still be in La Paz today (two years later), with the Land Cruiser in 1000 pieces. 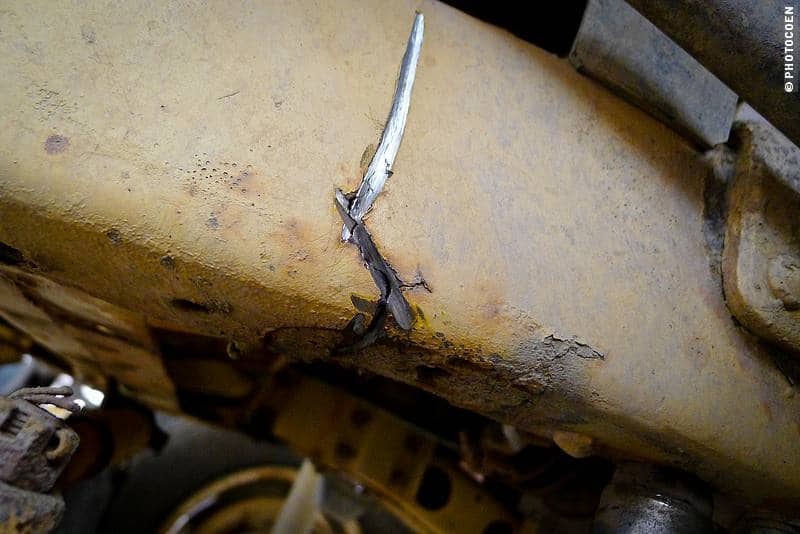 Welding a crack in the chassis. Do you have information we should add to this page? Please share it with us in the comments below so other travelers may benefit from it. Thanks. Other practical topics on Bolivia: Gas Stations Money Matters, our Travel Budget, and Documents (visa & car papers). Hi, we were wondering where you got your rust repairs done in La Paz in 2010? We’re here now and would love the name of the mechanic. Hi Isabella, even if I’d remember the name we wouldn’t give it to you. It was a horrible experience in every possible way with such bad work that within 3 months the first bubble of paint on the bodywork started to peel again. Within 2 years the roof needed to be taken off once more because of improper welding issues done in La Paz. Apart from our own experience, there is a rational reason not to get it done in La Paz. 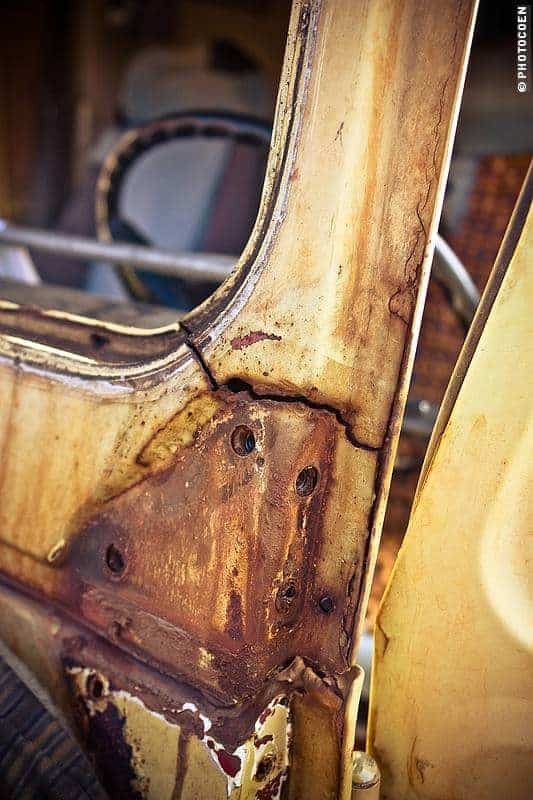 Because of the climate, cars don’t rust there and so there is no knowledge of how to thoroughly attack rust issues. Better drive to the lowlands, e.g. Santa Cruz, where the climate is humid and they properly understand the issue + have the proper materials (e.g. anti corrosion paint).